Fig Cottage is immersed in idyllic countryside and bordered by National Trust gardens, yet just 20 minutes from the magical city of Bath and a five-minute walk from four great pubs and cafes. 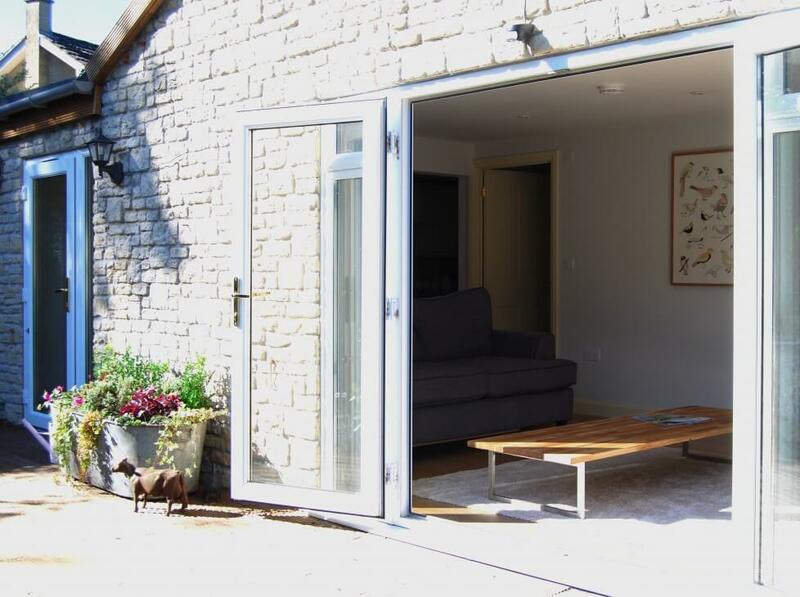 Beautiful Bradford on Avon is just two miles away, whilst Longleat House and Safari, Lacock Abbey, Avebury, Stonehenge, Stourhead and Dyrham Park are all within easy reach. 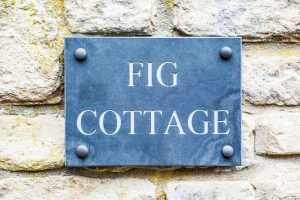 Fig Cottage offers stylish accommodation, just 20 minutes from Bath and five minutes from Bradford on Avon. 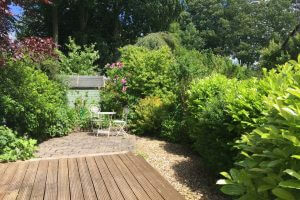 The light and airy cottage is tucked away in the gardens of a Grade II listed house in the pretty village of Holt, between National Trust gardens, the village church and open meadows. The modern kitchen is fully equipped with a Nespresso coffee machine, kettle, oven, hob, microwave, fridge freezer, dishwasher and washing machine. However, if you’d like someone else to do the hard work for you, just take a stroll round the corner to one of our four fantastic village pubs and cafes, where you’ll find award winning cuisine, delicious brunches, scrumptious cakes and an excellent latte. 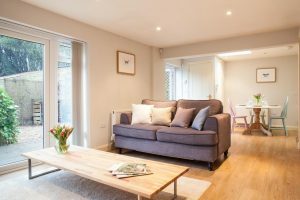 Fig Cottage has a spacious living area, with a comfy sofa, easy chair and double doors leading onto a private decked area and pretty courtyard garden. 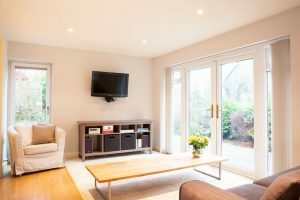 Relax on the comfortable sofa or armchair, watch the flat screen TV, listen to the stereo system or get stuck into a novel. Guests enjoy speedy WIFI, plus access to Netflix and other on demand TV. We also supply DVDs. 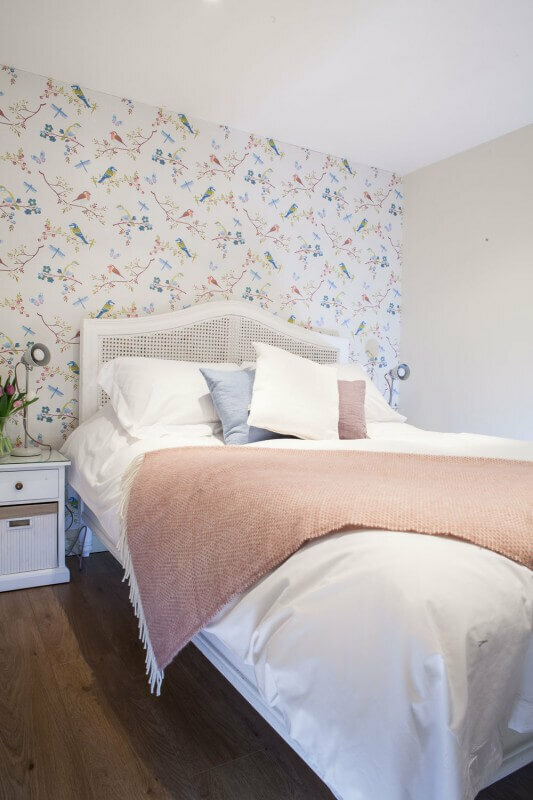 The pretty, vintage style bedroom has a superbly comfortable King size bed, made by luxury bed makers Loaf, crisp white bed linen and a feather duvet. At Fig Cottage, we are more than happy to provide a cot for any infant visitors, plus there is a sofa bed in the living area, which can accommodate two children or one adult (two adults if you’re prepared to be a little cosy). 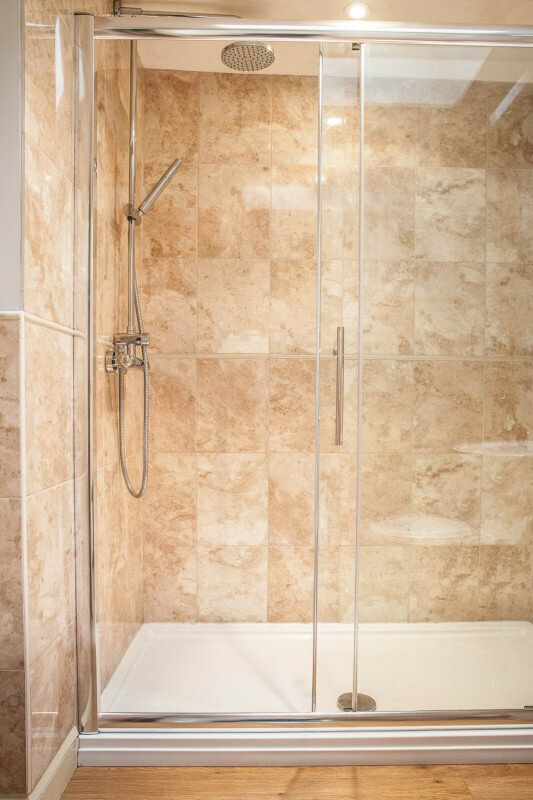 The modern bathroom has a large, walk in rainfall shower and fluffy white cotton towels. 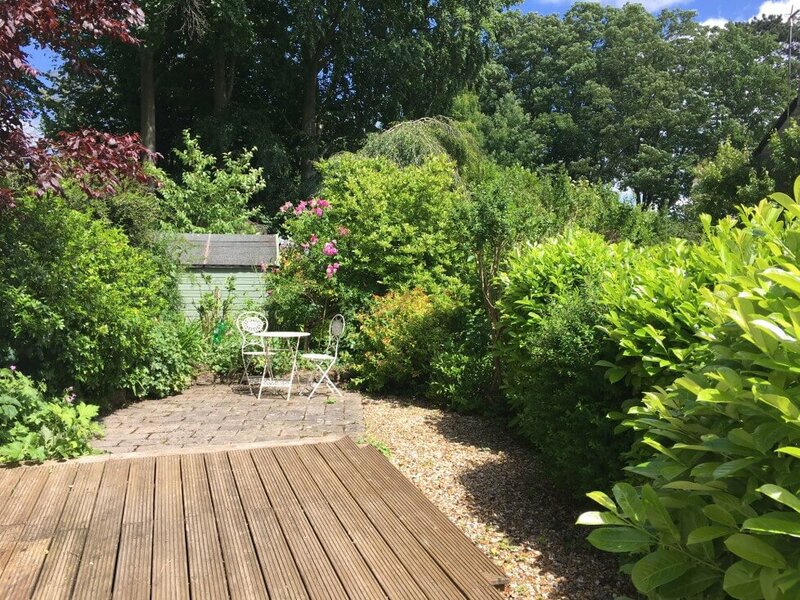 Location: Fig Cottage is tucked away behind open meadows in the idyllic village of Holt, just 20 minutes from Bath. It offers a tranquil village setting, yet there are four great pubs and cafes within a short walk. 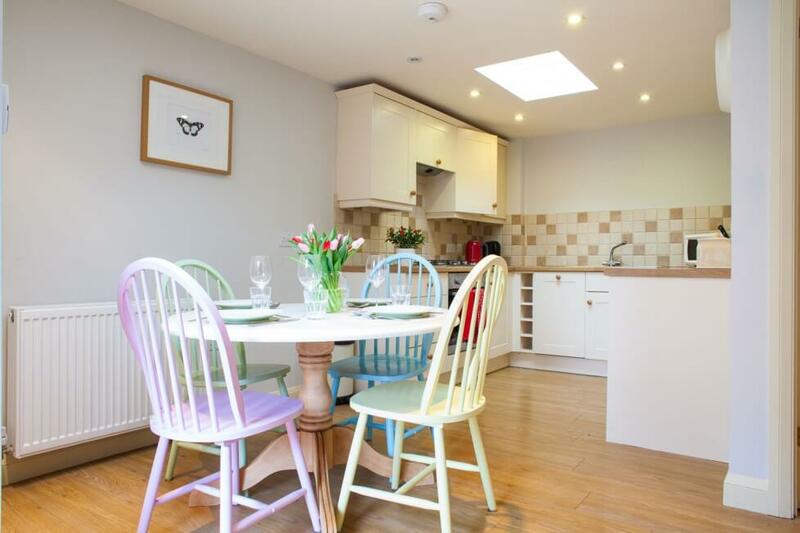 Sleeps: Fig Cottage offers one bedroom with a superbly comfortable King Size bed, plus a sofa bed which can sleep two children or one adult (two if you're happy to be cosy!). We also offer a travel cot for infants. Bedrooms: 1 bedroom with superbly comfy king size bed, made by luxury bed maker Loaf. Feather duvet and pillows, crisp white bed linen, white fluffy cotton towels and hairdryer are all included. The bedroom features a floor to ceiling window, chest of drawers, bedside tables and wardrobe with hanging space. Bathrooms: 1 bathroom with large, walk-in rainfall shower, sink and WC. 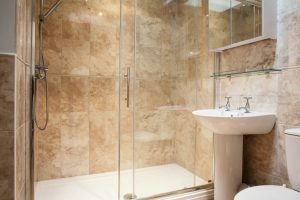 There is also additional storage space within the bathroom. 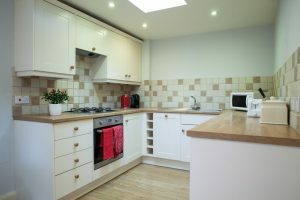 Kitchen: Fully equipped kitchen with oven, gas hob, microwave, Nespresso coffee machine, dishwasher, kettle, toaster, fridge freezer, washing machine, crockery, glassware, cutlery and all the bits and pieces you could need. There is also an iron and ironing board. There is gas central heating throughout Fig Cottage. Entertainment: Free, speedy WIFI, flat screen TV, DVD player, stereo system with CD player. Netflix, iPlayer and other on demand TV services are available too. Outside: Peaceful courtyard garden, surrounded by shrubs and roses, with seating. From the living area, large glass double doors open out onto a decked area. Weber BBQ available on request. General Points: Crisp, fresh bed linen and fluffy towels are included. 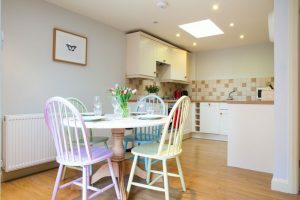 We'll also welcome you with a health stash of tea and coffee, fast WIFI and plenty of dishwasher tablets, washing up liquid and washing powder. Parking: Free parking is available directly outside Fig Cottage. Smoking: Fig Cottage is non smoking. Children: Children of all ages are welcome. We offer a travel cot for infants and sofa bed for older children. We are only too happy to provide a booster seat, blackout blinds and toys. Pets: We accept well behaved dogs, but ask that they are not allowed on the furniture. Train Station: Bath Spa station is ten miles, Bradford on Avon is 2.5 miles and Chippenham is 11 miles. Airport: Bristol Airport is 29 miles and London Heathrow is 94 miles. Food Stores: Holt Superstore is ¼ mile away, plus Waitrose, Sainsburys, Lidl and Asda are 3.6 miles away in Melksham. Local Pub/Restaurant: The Tollgate Inn, Ham Tree pub, Field Kitchen Cafe and Rose Garden Café are all within ¼ mile. The fabulous George at Woolley is 2.2 miles away and there is an array of great pubs and restaurants in Bradford on Avon, 2.5 miles away. The Courts National Trust Gardens ¼ mile, Great Chalfield Manor and Gardens 2 miles, Lacock Village and Abbey 6 miles, Longleat 16 miles, The Roman Baths 10 miles, Bradford on Avon bike and boat hire 2 miles, Westwood Manor and Iford Manor 5 miles, Cumberwell Park Golf Club 3 miles, Whitley Golf Club 4 miles, Bowood Spa and Golf Resort 10 miles, Castle Combe 9 miles. 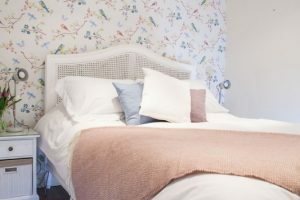 Short Breaks: From: £80 a night, three might minimum stay. One or two night stays sometimes available on request, please do contact us for rates.